The addition of a full musical ensemble has done little to alter Villagers’ sound, what with the lush, ethereal arrangements, the lonely reminiscing and reflection, and the hushed gaze that pervades these pieces overall. Originally the brainchild of musical wunderkind Conor O’Brien, Villagers have chalked up some remarkable accomplishment in their relatively short tenure, including Ireland’s highly coveted Choice Prize and consecutive nominations for the prestigious Mercury Prize for each of their first two albums (Becoming a Jackal and Awayland). O’Brien, who played every note on those early efforts, eventually yielded some of those responsibilities by expanding his one-man palette to encompass an entire band, with fellow travelers Tommy McLaughlin, Danny Snow, James Byrne and Cormac Curran also engaged in Villagers’ endeavors as well. Still, there’s little doubt even now who’s piloting Villagers’ progress, given that the sparse, evocative settings still carry the stamp of O’Brien’s solitary set-up. That’s true here with the superb and cerebral Darling Arithmetic, an album that’s every bit the equal of those two previous entries and certainly every bit as constant. In short, the addition of a full musical ensemble has done little to alter Villagers’ sound, what with the lush, ethereal arrangements, the lonely reminiscing and reflection, and the hushed gaze that pervades these pieces overall. O’Brien is given to intimacy via an introspective stance, and more often than not, these songs find the listener feeling like they’re intruding on some special, private place. The sound of seagulls winging their way over an ocean bridges the corridors between “Hot Scary Summer", a song which, despite its name, is lot less ominous than it is assuring, and “The Soul Serene", a track that posses a languid tone that effectively complements its title. And when O’Brien holds that lingering note on the album’s final entry, the modestly dubbed “So Naive”, the emotional investment is both calculated and confirmed. With all the introspection and allure, the shoegazing element remains a more than obvious intent. To their credit though, Villagers avoid the need to simply simmer in unsettled circumstance. Opening track “Courage” is both lovely and emboldening, a soft mantra that recalls Peter Gabriel’s heartfelt anthem “Don’t Give Up” in its ability to not only stir the senses, but also to empower the audience. The gentle drift of “Everything I Am Is Yours” is so serene and serendipitous, there’s never any doubt about the seriousness of the sentiments. And while the constant glide keeps much of the consistency throughout, “Little Bigot” gets a little bounce, breaking up that sense of sobriety that permeates the proceedings overall. Ultimately, Darling Arithmetic emerges as the ideal soundtrack for the typical Sunday morning respite following an evening of excess and entanglement. It’s akin to meditation, when the need to exhale becomes of utmost importance. 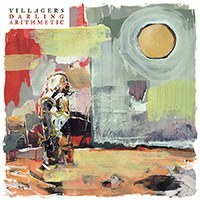 Most of all, it’s a graceful, beguiling and sumptuous set of songs, one worthy of both patience and praise, an extension of the excellence the Villagers brand introduced so early on. Darling Arithmetic is nothing less than calculated genius, manifested.